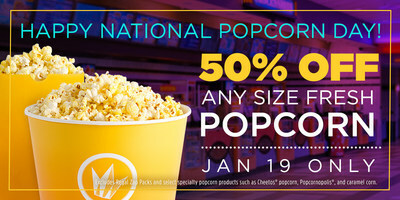 KNOXVILLE, Tenn., Jan. 17, 2018 /PRNewswire/ -- Regal Entertainment Group, a leading motion picture exhibitor owning and operating one of the largest theatre circuits in the United States, will celebrate National Popcorn Day with half-price popcorn* for moviegoers. This delicious opportunity is only available Friday, January 19 to fans of Regal's classic, buttery popcorn. "Regal's popcorn is a concession classic, and there is no better time to get this mouthwatering treat than on National Popcorn Day," said John Curry, Senior Vice-President of Food Service at Regal Entertainment Group. "Regal's popcorn has long been known as 'the popcorn' for movie lovers, and is an unforgettable part of the theatre experience. We are excited to offer this delicious option to guests for half-price in celebration of this fun holiday." Popcorn is a true classic for moviegoers, and Regal is pulling out all the stops for its fans with this blockbuster snack. Movie fans are invited to experience the delicious taste of their favorite buttery popcorn paired with highly-anticipated films, including 12 Strong and Den of Thieves. *The special half-price offer is available on all classic popcorn, excluding Cheetos popcorn, specialty popcorn and Snack Packs. Regal fans are encouraged to like Regal Cinemas' Facebook page and download the Regal Movies app. Moviegoers can program their favorite theatre and purchase tickets all from their mobile device. The Regal app also gives patrons the ability to join the Regal Crown Club card straight to their phone for easy access while on-the-go. Through the industry-leading Regal Crown Club, approximately 14-million active members each year accumulate credits at the box office and concession stand to earn rewards including free popcorn, soft drinks and movies. Free membership is also available online at http://www.regmovies.com/Crown-Club. 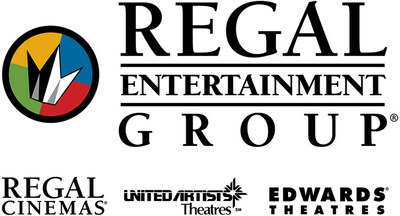 Regal Entertainment Group (NYSE: RGC) operates one of the largest and most geographically diverse theatre circuits in the United States, consisting of 7,315 screens in 561 theatres in 43 states along with Guam, Saipan, American Samoa and the District of Columbia as of September 30, 2017. The Company operates theatres in 48 of the top 50 U.S. designated market areas. We believe that the size, reach and quality of the Company's theatre circuit not only provide its patrons with a convenient and enjoyable movie-going experience, but is also an exceptional platform to realize economies of scale in theatre operations. Additional information is available on the Company's website at www.REGmovies.com.